Shangri-La’s Rasa Sayang Resort & Spa, Penang’s lavish Sunday Champagne Brunch takes indulgence to new heights with a smorgasbord of the finest treasures served at Feringgi Grill. Discerning dinners will love the buffet’s luxurious spread of imported produce and premium Perrier-Jouët Grand Brut Champagne presented with impeccable finesse and artistry. Launched in May, the Champagne Brunch May will be held every last Sunday of the month for a feast that is second to none. Feringgi Grill Chef de Cuisine Thibaut Pouplard’s culinary interpretation is a culmination of his early days in the Loire Valley, his sojourn with Mediterranean cuisine and his forays into Eastern flavours – resulting in delicately balance epicurean delights that mirror his culinary travel spanning Europe, the Middle East and Asia. For the Champagne Brunch, the French chef’s menu is specially designed to complement the champagne, with items laid out at several themed sections around Feringgi Grill. One room is set up to resemble a mini garden where diners can ‘harvest’ various leafy and root vegetables alongside their favourite dressings, cold cuts and antipasto. Next door, platters of Duck Breast Salad and decadent Foie Gras Terrine in a barn-like setting can be seen. These dishes taste great even when taken plain or with brioche and fig jam. 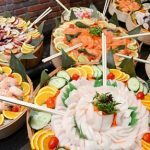 At the seafood-on-ice section, one can dive into bountiful fresh marine morsels like shrimp, scallops, snow crab claws, mussels and French oysters. Sashimi lovers will not be disappointed with the assortment of top-notch cuts, such as Canadian salmon. There is also Gravlax in different curing styles. 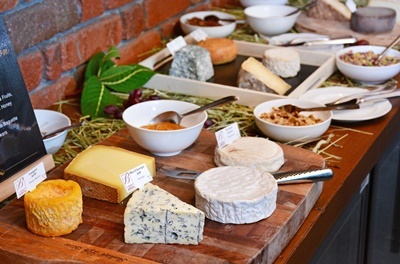 Cheese connoisseurs will discover paradise inside the wine cellar, where a dozen varieties of imported artisanal cow and goat milk cheese from France like Valencay, Langres, Bleu d’Auvergne, St Romans, Timanoix and Tome de Rhuys await. Those are just the starters. Mains are cooked to order, so guests may refer to the day’s featured menu. It is a buffet, so diners may have as many helpings as they like. Choices include Lamp Culets with Ratatouille, Snapper Meuniere, Salmon with Orange Gremolata, Roasted Sea Bass, Beef Tenderloin with Sarawak Pepper, Seafood Risotto and Chicken Breast with Chimichurri. The dessert selections at Feringgi Bar feature the most popular luxury desserts, including well-presented puddings, tarts, cakes and macarons, which will ensure a sweet ending to a delightful dining indulgence. The Sunday Champagne Brunch is served from 12 noon to 3 p.m. so that diners can take their time, indulge and enjoy the gorgeous views of Rasa Sayang Resort grounds all around. The Sunday Champagne Brunch is priced at RM398 nett person and at half price for children. For enquiries or reservations, guests may call the guest service centre on (60 4) 888 8788. Golden Circle members may book online at www.GoldenCircle.com/TheTable.